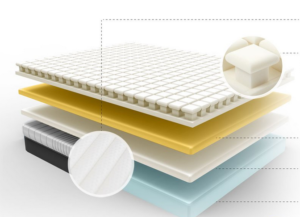 Luxi offers a bed-in-a-box foam/latex combination mattress with a unique adjustable feature – the ability to split and flip the individual layers. Sleepers can customize the firmness layer of the entire bed, or just their individual side of the bed, by unzipping the cover and rearranging the foam layers inside. The company was founded in 2015 by the father/daughter team of David and Shannon Farley. Get $75 off the Luxi mattress and receive 2 free pillows ($188 value)! 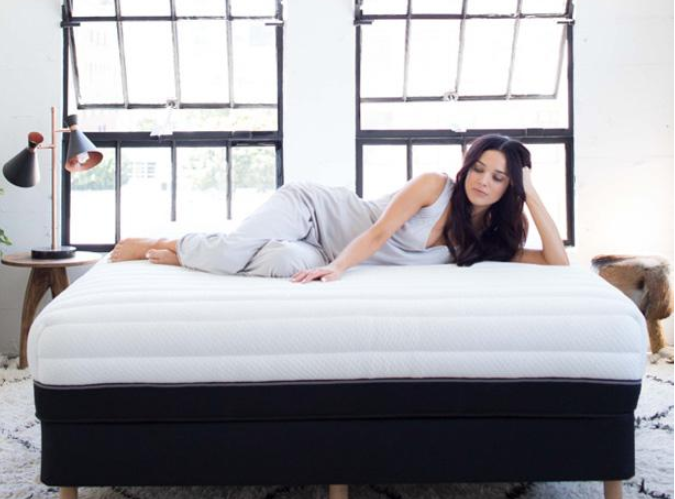 Built in Southern California, the Luxi mattress is a 10” mattress with 4 foam layers, one of which includes latex. These layers consist of a 3.5” layer of base poly foam, a 1.5” layer of latex foam, a 1” layer of memory foam, and a unique patented 3.5” layer of “support balancing technology” foam heads. The mattress is available online, at the company website only, and ships within 3-5 days directly from the manufacturing facility to the consumer. It comes in 2 models, the standard Luxi and the LuxiOne, which is not adjustable. Offgassing: Even though it’s memory foam, this mattress is relatively smell free. The foam used is CertiPUR-US® certified, which guarantees the absence of dangerous toxins, such as formaldehyde. The layers here have been designed for breathability, and both verified purchasers and reviewers alike have noted the ability to use the mattress right away after arrival. Temperature control: Even warm sleepers should sleep comfortably on this mattress due to several features included to enhance breathability. The base layer of polyfoam has an open cell structure, and when you combine that with the addition of a latex layer and the open-channeled “SBT” layer, you have the formula for enhanced airflow and a cooler sleep. Price: Billed as a luxury mattress, both the LuxiOne and the Luxi are reasonably priced mattresses made from durable materials. The addition of memory foam inside the quilted cover is a nice touch in keeping with the overall high quality of the materials used in this mattress. Luxi mattresses become an even better deal when using our promo code for $75 off plus two free pillows. Reputation: Luxi is a relatively new company, and while the mattress they call “Luxi” has been on the market since the beginning, the “LuxiOne” version is brand new with very few reviews. Luxi mattresses are not sold on Amazon, so Amazon reviews aren’t available. Customer reviews are scarce and only available on the company website itself. Longevity: Again, this factor is due to the company starting in 2015. The materials used in their construction are high quality, but the mattresses haven’t been around long enough to accurately gauge the expected lifespan. Overall, memory foam mattresses are expected to last 10 years on average, with density of the foam being a major determining factor. The higher the density level, the longer the expected lifespan. Warranty: The company advertises a 10-year warranty, but specific information on the details of the warranty agreement are difficult to find. A warranty page is not available for potential buyers to view on the website. Upon inspection, the warranty only covers sagging and indentations above 1 ½”, while 1” or less is standard. Luxi began in California in 2015. Founder David Farley is an engineer with many years’ experience in the sleep industry who started the brand with his daughter, Shannon. She brought her social media expertise to the table. The manufacturing facility is located in Southern California along with the brand’s headquarters. Luxi has been rated F by the Better Business Bureau at this time. This rating is based on 5 complaints filed since 2015 and the company’s failure to respond to 2. All complaints received by the BBB are related to difficulties apparently met by customers trying to return the mattress during the sleep-trial period. Both customer-service issues and mattress-return issues are noted. The brand has earned a rating of 4.6 on its own Facebook page with 87 reviews. On the website, the company shows 378 five-star-only reviews. As the mattress is available only through the website, not through Amazon or other retailers, the company-provided reviews are the only customer reviews available. Through its giveback program, the company states that it donates “a percent of sales” to a charity of your choice. Luxi has attracted media coverage from outlets such as ABC and Forbes. The Luxi brand’s mattress comes in 2 models with 6 sizes, including Twin XL and California King. For the larger sizes, the foam layers are split into two sections, and encased in an inner cover. This feature allows dual customization of the firmness level by rearranging the layers on either side. Both models, the Luxi and the LuxiOne, are combination memory foam/latex foam mattresses made up of 4 core layers. The mattress is shipped to the customer at the medium-firm arrangement. “Support Balancing Technology” layer: This layer consists of 3.5” of foam molded into foam heads with channels in between. (See illustration above) The construction allows for resistance and mimics the spring you would find in a coil construction. It helps prevent sagging and body impressions and promotes airflow. Memory foam layer: The memory foam layer contains 1” of 4lb.-density memory foam. Placed on top, this layer can provide the classic plush feel of a foam mattress for maximum softness and body contouring. Latex (or ”Luxitex”) foam layer: This second foam layer contains Dunlop latex. Dunlop latex is all-natural latex made from the sap of the rubber tree without the addition of petroleum based chemicals found in synthetic latex. The addition of latex to the foam allows for better cooling as well as an added layer of support. Base poly-foam layer: The base layer of this mattress consists of 3.5” of high density poly foam for support. The foam in this layer uses an open cell construction that aids in airflow and breathability. The Luxi mattress is manufactured in Lavern, California. Luxi (adjustable) Twin $899 47 lbs. Luxi (adjustable) Twin XL $899 50 lbs. Luxi (adjustable) Full $1099 67 lbs. Luxi (adjustable) Queen $1299 80 lbs. Luxi (adjustable) King $1599 102 lbs. Luxi (adjustable) California King $1599 102 lbs. Purchase your Luxi mattress here and get $75 off plus two free pillows. The Luxi website advertises a “100 night trial – 1000 night pledge.” Though the title seems ambiguous, the company is very clear on its 1000 night pledge page that if you are not satisfied with your purchase, the first step in the process is to call and have a discussion with one of their “Sleep Experts.” They make every effort to avoid returns through experimentation with the adjustable feature of the mattress and take their environmental responsibility seriously. The company refers to both a “1000 night pledge” and a “100 night trial.” Effectively, that means you can return the mattress for a full refund within 1000 nights after a 30 day wait period. The mattress will be shipped via FedEx within 3-5 days of the online order. Shipping is free to all states in the US and to Canada. A signature is required by FedEx only in Canada. The mattress will arrive compressed and sealed in a box and will inflate quickly upon opening the plastic. Luxi provides a 10-year manufacturer’s warranty covering defects. The mattress may be used on any supportive base, including an adjustable base, and the use of heating pads or electric blankets does not void the warranty, according to the company. Luxi earns a high rating from customers in this area. The foam/latex construction should produce a sleeping surface free of excess bounce. Even with a restless partner, sleepers should feel little disruption due to the absorbent layers of foam. The unique coil-mimicking layer of “SBT” foam combined with the latex layer offer a surprising amount of edge support for a foam mattress. You won’t experience edge collapse while sitting, and sleepers of moderate weight should find sufficient support for edge sleeping. Although new to the market, several factors provide positive indicators for the durability of this mattress. The use of heavier 4 lb. foam, along with a well-constructed cover and a latex layer, all should contribute to a longer life and less sagging. Customers report satisfaction with the quality of the materials. The fact that all materials and mattress are made in the US should contribute to a high standard of construction. The firmness level of the Luxi model depends on the arrangement of the layers you choose. The firm arrangement rates an 8 on the firmness scale. The medium arrangement rates a 6, and the soft arrangement rates around 3.5. The mattress will be shipped at the medium-firm setting unless you request otherwise. The non-adjustable LexiOne model rates at the medium (6) level. This brand has taken great measures to avoid the hot sleeping effect of many of the older versions of memory foam mattresses. The latex layer adds a cooling component, as does the open cell construction of the base layer of foam and the channeled layer of foam built of foam heads. Set at the softest level, there will be some body-heat retention in the memory foam with the expected level of sinkage. Customers report little smell upon opening this mattress, and no problematic lingering odor. Luxi has used certified non-toxic foam, natural latex, and breathable materials. You should reasonably expect to air the mattress for a few hours after removing from its box, but customers have used the mattress right away without complaint. This mattress will provide a bit more bounce than strict memory foam constructions due to the latex addition. For recreational purposes, the arrangement you choose will affect your experience. Overall, the “SBT” and latex layers allows for a subtle springy feel and enough give and take to avoid feeling stuck. The Luxi cover, though removable, is not designed to be washed. Spot clean only, and take care not to saturate the mattress with any liquid substances. Use a damp sponge on soiled areas and be mindful of the memory-foam layer within the cover. Water and a mild detergent or a vinegar solution are recommended for foam mattresses to protect the foam from breakdown. Vacuum the mattress regularly with an upholstery attachment and with the cover on. After arranging your inner layers, the mattress is not meant to be flipped. It’s a solidly constructed mattress, but rotating occasionally will help prevent sagging.